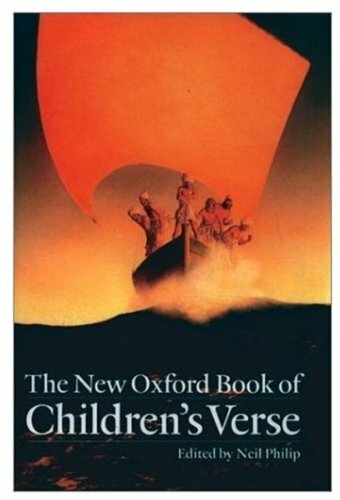 The New Oxford Book of Children's Verse is a highly significant publication, as it will run alongside (perhaps replace?) Iona and Peter Opie's seminal Oxford Book of Children's Verse of 1973. The aim of this publication is to set out a fairly definitive canon of children's verse primarily to inform adults, not to create an anthology directly aimed at children. Both the Opies and Philip focus (rightly) on those who wrote for children. The major difference between the two volumes is that the Opies concluded with Ogden Nash and excluded twentieth-century poets who were still alive. The result was an excellent historical anthology which was less convincing in its representation of the twentieth century. As Philip devotes more than half of his book to the twentieth century, this was his chance to repair the balance. Philip's strengths lie in his knowledge of and feeling for traditional verse, his willingness to appreciate the rhetoric of contemporary popular poetry, and his distinct and coherent editorial line which is clearly stated in a well informed Introduction. The distinguishing features of children's poetry for Philip include 'immediate apprehension', 'clarity, directness, mystery' and a 'sense of wonder'. No quarrel there. It is all too easy to cite omissions in an anthology; I remain, however, puzzled by some of Philip's choices. He begins with a single Watts's poem from Divine Songs of 1715, whereas the Opies offered 45 pages of poetry written before that date. Christopher Smart also gets a single poem, but gone are some classics of the nursery which are still well known today. Gone too are William Roscoe's 'Butterfly's Ball' and Catherine Ann Dorset's 'The Peacock at Home' which, delightful in their own right, were so influential in the first decade of the nineteenth century. By cutting out these poets and others, the historical representation is a bit thin. Philip provides better coverage of the Victorian/Edwardian period and the first half of the twentieth century, though even here he fails to include popular poets of their time like Felicia Hemans, Aunt Effie (Jane Euphemia Browne), Juliana Ewing and, later, E V Rieu (of Sir Smashemup fame), yet he finds space for a number of obscure poets hardly known within the children's canon. I cannot see the logic of including single poem entries by a dozen poets of whom most readers, old and young, will not have heard, while important voices of the past are lost. In terms of contemporary poetry, Philip cannot be faulted in his attempt to give proper recognition to poetry by black writers in Britain and America. For example, he gives deserved prominence to Langston Hughes, Nikki Giovanni and Jackie Kay. It was good to see the Caribbean represented by Frank Collymore and Michael Smith; and Aborigine and Native American poetry has a small place, too. While rightly underlining the significance of performance in the late twentieth century, Philip appears less confident in this area, selecting one of the few poems by Ben Zephaniah, for example, which focuses on written rather than spoken language. Overall, Philip's touch is less sure in the latter part of the twentieth century. What reasoning persuaded him to exclude Kit Wright and Adrian Henri while Mick Gowar stretches to six pages with a good, but untypical poem? A similar blind spot is apparent for Shel Silverstein, probably the most inventive of American humorists; Jack Prelutsky, beloved by most young children, gets one short poem. Philip is on surer ground when dealing with British poets like Hughes and Causley and American poets like Sandburg and McCord, where his selection is wise and representative. This anthology will be regarded by many people as the touchstone of wisdom about children's poetry so Philip had a mighty difficult job on his hands. Although there is a slight ragbag feel to the book, it is certainly very good in parts.